Moccasins are the original shoe of this continent. 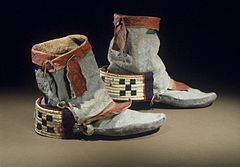 Historically the footwear of North American Indians, they were adopted by some European hunters and trappers as they came "across the pond" and settled in here. 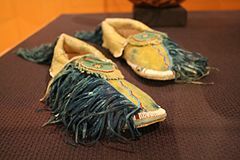 Moccasins are shoes made of soft leather (animal hide) and often times sported beautiful embroidery or beads. They are typically made from a single piece of leather and then stitched up and around the foot in a variety of ways. Do you have some nice, soft deer hide hanging around? No? Well, that's ok. You can still make some moccasins with your kids! TELL YOUR OWN STORY WITH SHOES! If you wanted to tell a story with your shoes, what would you decorate them with? Tissue paper? Markers? Glitter? What colors do you love? How would you share what is meaningful to you on such a small surface? Grab your newly created moccasins or a sturdy old pair of shoes that could use a refurbish and get crafting! We'd love to see what you create! Newer PostIt's Warm Inside This Igloo!